TORONTO (Oct. 1, 2018) — After all the ultra-colorful spectacles in many of Chinese director Zhang Yimou’s films in recent years, it is gratifying to see a production that exudes contemplative artistry and aesthetically soothing individuality. Contrasting with the thousands blooming yellow chrysanthemums adorning the Imperial Palace grounds in “Curse of the Golden Flower” (2006), or the massive,CGI-infused monster attacks in “The Great Wall” (2016), “Shadow” is an elegant Chinese ink brush painting. Its monochrome, almost black-and-white palette is the prominent appeal of Zhang’s latest feature. 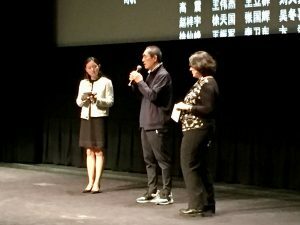 Audience at the Toronto International Film Festival in early September, 2018, were one of the first to enjoy Zhang’s “Shadow” when it had its North American premiere straight from Venice. The film did not open in China domestically until Sept. 30. China’s iconic director reassures audiences that he has not lost the cinematic artistry he was first noted for as in “Raise the Red Lantern” (1991) and the touch of the personal in “Not One Less” (1999). Set in historic China, the story begins with the Kingdom of Pei being overpowered by an invading enemy led by General Yang (Hu Jun). Pei’s strategic city, Jing, has been lost. Ruling Pei is an egotistic and cowardly king (Zheng Kai), who would rather seek a subservient peace by giving his sister (Guan Xiaotong) as a bride to the enemy than fight the invaders head-on, turning down war as counseled by his own Commander Yu (Deng Chao). The intrigue of the plot centers on the fact that Commander Yu, who has suffered a near-mortal wound in his last battle with General Yang has trained a body double, or ‘shadow’. When he was a boy, Yu’s father was assassinated. His uncle snatched a look-alike from a village to be raised as his body double to protect his nephew from future harm. The shadow now stands in the Pei court to push for war with the enemy, his advice rejected by the king. The real Commander Yu hides in a secret lair near the palace, weakened by his injury but still scheming fiercely to take back the city of Jing and fulfill his own personal revenge against General Yang with his fake double. Deng plays both roles as the real Yu and his body double effectively, his acting as well as camera work should take the credit. The harsh reality for both the real and fake Yu is the sharing of the same woman, Madam Yu, played by the actor Deng’s real-life wife, the popular Chinese star Sun Li. With the acting partners being a real-life couple, it is interesting to note that true and false is multi-layered here. The logistics of a body double may sound incredulous and baffling, but the film’s riveting story and actions together with the aesthetic appeal leave viewers not much time to stop and try figuring out the details. Zhang’s exquisite color scheme is the effect not from shooting in black-and-white but having the true colors reflected in the set design and costumes. Panels of ink brush calligraphy line the Pei court’s interior space, and costumes are stylishly designed in black and white. It looks like the prominent color that stands out is the flesh tone of the characters, and later, stark, red blood as warfare and a deadly duel engulf the screen. While helping her real husband to train his double in Wu Xia fighting techniques in the secret lair, Madam Yu demonstrates the softer, female power, the Yin, as a strategy to counteract the macho Yang of the invading enemy. The invention of a blade-clad umbrella will prove to be the winning weapon of choice later. The final battle to retake the City of Jing may evoke the Greek myth of the Trojan Horse, yet the duel to the death between the shadow Yu and the arch enemy General Yang reminds audience that the idea is grounded in Chinese Taoist’s Yin Yang duality. But director Zhang’s artistry is not so much revealed in this gruesome duel, or the massive and muddy warfare however inventive the weaponry. The film’s appeal, indeed, the Yin power, is the female charisma of Sun playing Madam Yu and Guan as The Princess, the king’s sister, who chooses to defy her brother’s arranged marriage for her to appease the enemy. The period epic may have a huge canvas set in historic China, the focus is affectively personal. The most impressive scenes are the intimate ones depicting the restrained passion between Madam Yu and her fake husband. Notable is their duet on two guzhengs, the Chinese zither, ordered to play as a test in front of the suspicious and dangerous King. The tension is accompanied by the potent stringed music from the guzhengs, artistic and riveting. 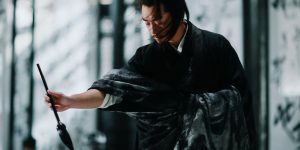 It is a scene that is reminiscent of Zhang Ziyi’s dance among the drums in the director’s earlier feature “House of Flying Daggers” (2004), an intense sequence exuding strength with grace. In the Q &amp; A after the screening, director Zhang emphasized his mode of storytelling in “Shadow”, in particular, the focus on the ordinary man as portrayed by the body double here, fighting not so much for his master but to regain a sense of self. Shifting from the masses to the individual, from kingdom warfare to personal choices, Zhang’s “Shadow” leaves audience with an open ending, one that closes just short of revealing his characters’ decision, a powerful statement on the agency of personal action. This is another appeal of the film.